(Picture, courtsey : Cell) Omega-3 fatty acids ( -3 FAs), DHA and EPA, exert anti-inflammatory effects, but the mechanisms are poorly understood. Now the researchers show that the G protein-coupled receptor 120 (GPR120) functions as an -3 FA receptor/sensor. As per the claim by the researchers, stimulation of GPR120 with -3 FAs or a chemical agonist causes broad anti-inflammatory effects in monocytic RAW 264.7 cells and in primary intraperitoneal macrophages. All of these effects are abrogated by GPR120 knockdown. 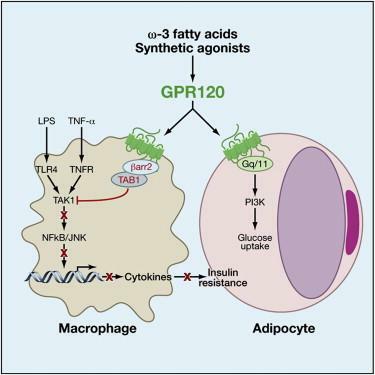 Since chronic macrophage-mediated tissue inflammation is a key mechanism for insulin resistance in obesity, researchers fed obese WT and GPR120 knockout mice a high-fat diet with or without -3 FA supplementation.